Pray to God. Do no harm. For Maryland mathematician Dr. Nigel Su­bramaniam Siva, these sentences emerge like spiritual lessons from two stories that mark turning points in his life. Unemployed in 1983 in the city of Jaffna in Sri Lanka, he spent months painting sacred images in oil on the interior walls of the city's Kali Temple while praying for work and a new life. He had written to Prof. Robert F. Dressler in the USA where he felt his grasp of higher math would make him useful to those studying important but esoteric subjects—crystal growth in microgravity and atmospheric density currents, for example. He had heard nothing back. And then one day a devotee at the temple said to him, "Kali has just told me that within the next ten days you will get a job." Nigel's astonishment from that pronouncement of 26 years ago still fresh in his voice, he exclaimed, "I had never told him or anyone else that I was looking for a job in America! And within ten days, I got a letter from Prof. Dressler with a job offer at the George Washington University." This answered prayer inspired him years later to create the Jaffna Kannathiddy Kali Kovil Endowment through Hindu Heritage Endowment (HHE). The fund supports the Kali temple where the prescient devotee foresaw his new career. The fund pays for the temple's electricity and the oil for its lamps. He hopes someday the principal will be large enough that its income can also cover puja supplies. For the moment, he says, his gift keeps the light of his gratitude glowing in that sacred space were he experienced the power of prayer. With his newfound career came travel in a new country and culture. 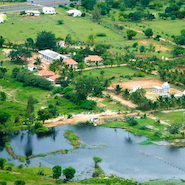 "In the US, I was no longer practicing the Hindu tradition of vegetarianism," he said. In 1999 he became vegetarian once again. "As a Hindu, I feel that one should do no harm," he explained. He saw vegetarianism as a way of extending this belief to the animal kingdom. More than a dietary choice, it symbolizes his commitment "to do no injury to any living things or the environment." This second turning point he celebrated by starting a second fund at HHE, The Cows of Kadavul and Iraivan Temples (Kovil Maadu) Endowment. 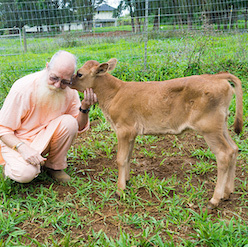 The fund provides for the care, feeding and medical needs of Kauai Hindu Monastery's cows. The fund was a way to mitigate the karma resulting from a meat-eating past, he said. "But far more important is that the fund perpetuates a very good thing. At the Kauai monastery, dairy products are used in rituals and to nourish the monks, who in turn teach Hinduism all around the world." He views the Cows Fund as a small gift with a great effect. Dr. Siva likes the perpetual nature of endowment funds that use income only while preserving principal. He encourages others to consider establishing their own permanent funds at HHE. "When you do good things, goodness comes back to you," he observed. While his funds relate to his own life's journey, "they are not only for me. They go beyond selfishness. They are for others, and they are forever." 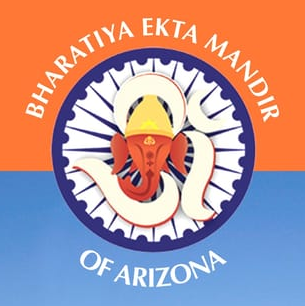 To learn how you can support these two endowments through a will, life insurance or other planned gifts, contact Shanmuganathaswami at 808-822-3012, extension 244 or hhe@hindu.org. Donate to these endowments (fund #77 and #78) at www.hheonline.org.